For the 7th installment of our D1 driver's column, we would like to present Daigo Saito. 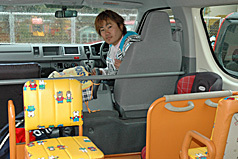 Since the 3rd round of the 2004 D1 Grand Prix, Daigo has been driving a 4 door sedan which is known not to be a much popular platform for drifting. Although his career is still at a freshman level, his velocity and intensity makes this young contender a promising warrior. He may also come off as a quiet mannered person, but is really a talkative and friendly fellow. Let's have Daigo tell us a few things about himself! I was really into motorcycles only because my father was really into it since I was a kid. Ever since I was 16, I had a motorcycle license and frequently went riding with my biddies. Then one day as we went riding over night in a place called Karuizawa, we encountered a mysterious pack of people in the mountains. There were many Skylines and Silvias however one vehicle took all my attention. A white Mercedes Benz sedan was sliding graciously through the turns and at that moment, I thought to myself “Wow! I want to drift too!” The intense sight of the oversized sedan drifting the corners was something that was implanted in my memory forever. At that time, I was still not old enough to obtain my drivers license so I hastily waited until I was 18. Even while sleeping, I was dreaming of drifting. This Mercedes had a huge impact towards me and is the primary reason why I compete in a 4 door sedan today. A few months after witnessing that magical 4 door sedan drifting, I acquired my drivers license! My father opposed of the idea of buying a car that was suited for drifting, thus I ended up with a Mini Cooper. At the time, I didn't know that a front wheel drive Mini Cooper was not the perfect platform for drifting. Soon after, I totaled the car trying to race. After that experience I bought myself an S13 without my parents' consent. Still not knowing anything about cars, I just bought a car that had a Silvia badge on it not realizing it was the naturally aspirated model. If I knew better, I would have totally purchased a turbo model which had more power and easier to drift. Anyways, I just wanted to try to drift a car so I headed to a corner at this certain mountain road. I didn't have the slightest clue of how to let the car slide like I have seen it so without seeking instruction I just practiced. As I started practicing, I really started to get into it and despite the refueling and food breaks, I noticed that 36 hours had passed by. On top of that, it was 36 hours of practicing a single turn. This practice session proved to be a tremendous help with left and right hand turns. Few days after, my muscles were sore especially from yanking on that emergency brake for 36 hours. All my friends are aware that I tend to not like being by myself so 2 of my biker friends took turns watching me for 36 hours. Because of them, my driving skill had increased tremendously. I still treasure ad give thanks to their friendship today! Within 2 weeks, I had to part with the S13 that I mastered the left and right drifts with, where I had challenged the “chokudori”. The S13 became a total loss after I wrapped it around a tree from a single mistake. My love for animals spreads not just for dogs to reptiles, but a broad variety of living things; even the weirdest creatures. I've owned all kinds of pets in the past, even a Savannah Monkey for three years during my high school years. The monkey wore a diaper and I took care of him inside my home. One sport that I play hard is badminton. My parents played and I have been playing for over 15 years now. I guess I took interest in this sport because it has always been in my family since I was in grade school. I got into my high school with badminton under my belt and I practiced like a mad man every day. These experiences enable me to withstand long hours of rigorous training like the 36 hour drifting. I don't mean to brag but in a city called Tokorozawa, I was the best badminton player. After graduating high school I went on to teach this sport to the neighborhood kids and even middle school kids as their coach. A few years back I can recall only doing these two things back to back. Badminton and drifting everyday. Lately I have been so busy with D1 that there is no time for me to play badminton. Just call me Daigo sensei! My house is in fact a nursery school, and I help run things here. It really doesn't fit my character does it? My friends make fun of me sometimes but its so much fun. I love children especially when they all call me Daigo Sensei! My primary duties here include taking care of the animals such as the rabbits, guinea pigs, roosters, and dogs. When they have events for the kids, I'm in charge of driving the nursery bus. I will try my best in D1 this year! The reason why I became involved in D1 is because my friend had asked me why I didn't compete. The first time I entered a competition, I made it to the semi finals! From that point on, I was destined to be a D1 contender. If my friend didn't ask me that question, I don't think I would be here this day. The mountain roads were my playing grounds back then, and I rarely ran an actual race track so I never thought id even make it to the semi finals. It's great that I have become a D1 driver however sometimes I think to myself “Now what am I going to do from this point on?” One good thing about being a professional driver is that my parents actually allow me to have a loud and fast car. My family fully supports me of my career. In 2007, I'm going to show to the world my quick and stylish drifting! My D1 machine will be equipped with a 2JZ setup so stay tuned! 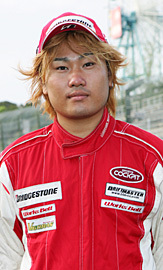 Daigo Saito started to compete in the D1 series from the 3rd round of the 2004 season. The red Mark II JZX90 4 door sedan displays unbelievable speed and confidence! Daigo is the young and promising driver who is shaping the future of D1. Everyone in Daigo's household play badminton. 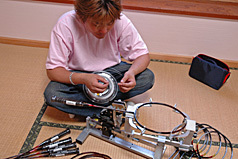 They even have a machine to restring the rackets. Daigo was an acclaimed famous badminton champion while he was in high school. His brother on the other hand, is currently a top ranked badminton player in Japan. 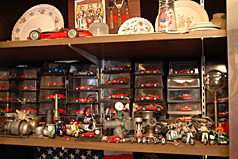 This is the Ferrari toy cars that Daigo and his father collect. The pieces that they collect all have a serial number on them signifying a die hard collector characteristic. Daigo's most prized possession is this rabbit. He has been raising it in his room ever since it was born. 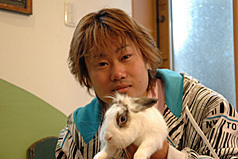 Growing up, he has taken care of all kinds of animals so no creature remains unfamiliar to Daigo.